Pearl Jam are streaming a performance of their 1994 track, “Corduroy”, as a preview to the debut of their concert film, “Let’s Play Two”, and the release of its companion soundtrack album on September 29. Directed by Danny Clinch, the project captures footage from the final two shows of the band’s 2016 North American tour at Wrigley Field in Chicago, IL last August. "In my films and photographs, I love to explore the relationship between a band, their fans and the location," says Clinch. 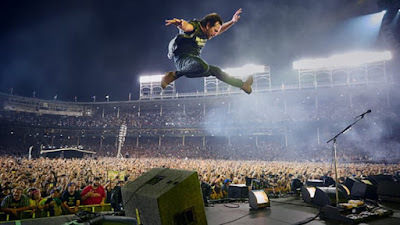 "When it happens that the main characters of your film are Pearl Jam, the Chicago Cubs, their fans, and Wrigley Field during a historic moment, you know it's going to be epic. Our instincts were correct to follow the story and it took us to a historic Game 7 of the World Series ending a hundred-and-eight-year drought for the Cubs. I have learned to welcome the unexpected and it always pays off if you're ready for it." Pearl Jam will premiere “Let’s Play Two” with a pair of exclusive screenings for Ten Club members at the Metro in Chicago, IL on September 27 and 28 ahead of its official debut in select theaters starting September 29. “Let’s Play Two” will see its US television debut October 13 on FS1 immediately following Game 1 of the American League Championship Series, ahead of its official release on November 17.